The demand for memes is high. 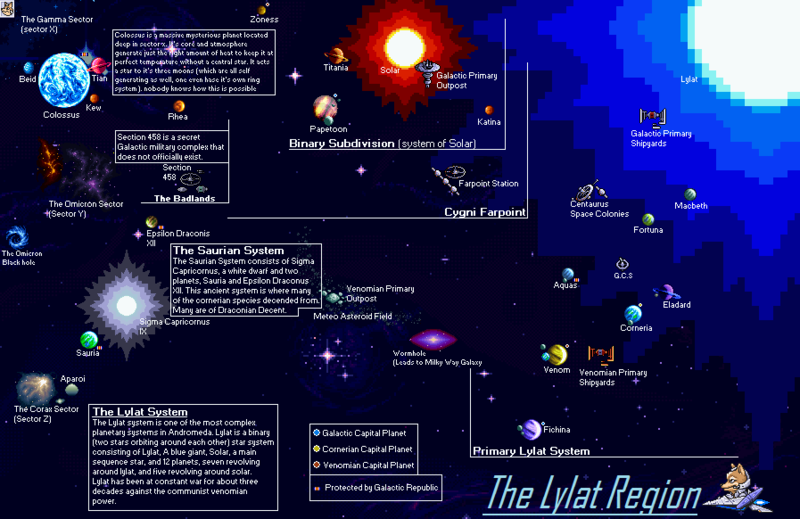 Here's the Lylat System from the StarFox games. Solar is (likely a large Gas Giant) at 3500 degrees K, making it a "Star" in this "game". Spica is the best comparison to Lylat, based on the size, mass, temperature and luminosity. It is based on the most well-known concept. Too bad ships can't be made, as there aren't accurate ship models on US2. I'm actually providing two separate "analogs" of Solar since there was such a debate in the fanbase about whether it was a star or a planet. I even argued that it was a very old metal white dwarf that cooled down to a red-orange color, its planetary nebulae forming sectors X, Y, and Z. 1. Solran, the smallest of Lylat's companion stars. A red dwarf. 2. Slaga, the legitimate recreation of Solar. A molten metal planet heated by nebulae and intense magnetism. Haven't really found a way to implement my white dwarf theory yet, and there might be a way to throw in a brown dwarf somewhere. I actually did use Spica as "Lylat Prime." I was surprised the default Solar System includes so many asteroids and smaller Kuiper Belt objects, but not the rings of Saturn or even major moons like Titan or Ganymede (or even Luna I think!). I like to view orbits on, but with so many objects, the view gets cluttered. So I removed some random objects (but not all of them -- is there an easier way to en masse remove all the non-dwarf planet Kuiper objects than selecting them all one by one?) and added major moons and Saturn's rings. Now it has more of the stuff I want, and less of the stuff not as interesting to me (and asteroid 2006NCC1701-A or whatever may be slowing down the simulation). I hope someone else likes it, or may improve upon it or find an easier way to remove more minor objects (I just started using US2 yesterday). Behold, the grandeur of my proudest creation—the Linaercanus star system. Linaercanus is a young main sequence star 354 millions years of age, 1.44 times the mass of our sun. With a grand total of 26888 bodies, including ring systems and asteroid belts, it is the largest stable star system I have ever designed—and, in my opinion—the most realistic, perhaps with a slight twist of the unexpected. At full stretch, the system spans 1.76 light years across, the most distant object taking an incredible 13.1 million years to orbit its star. With scattered dwarf planets in swarms of debris, a moon of a moon, and comets of extreme eccentricities and orbital periods in the tens of thousands of years, Linaercanus is an colossal and diverse system. There are endless wonders to discover, experience . . . and marvel. Due to the sheer number of particles in this simulation, time warp is reduced to about 30mins/sec at maximum. This rate may be improved via deletion of the said particles. A shortcut to do so exists in "Settings > Input." Recommended time warp rate: 0.8days/sec. Due to the sheer number of particles in this simulation, time warp is reduced to about 30mins/sec at maximum. This rate may be improved via deletion of the said particles. For the sake of some of our pixel potatoes, I'd recommend cutting down on the amount of asteroids in the belt. Just a tad excessive. Other than that, this is a very nice system. That "moon of a moon" was simple yet cool to find, and I love how there are several habitable planets. - More custom names. I notice that most of them are in-game generated. - Some planets and other objects for that rather lonely brown dwarf. Yeah, the asteroid belt that went a bit overboard was to try and keep with the realism aspect of such a young system. I expected there would be a lot of leftover debris. Maybe I won't choose such a young star next time. Hehe. I'm terrible at custom names. But sure, I'll give it a go. 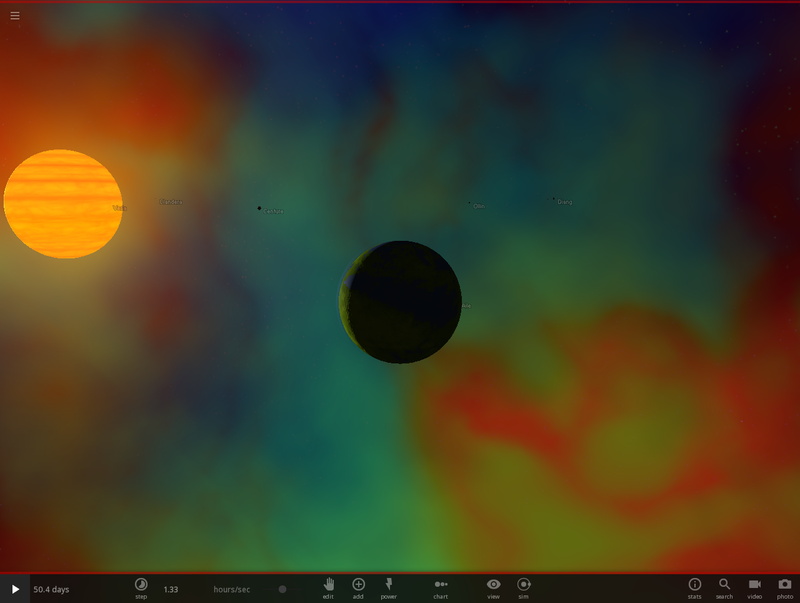 As for that brown dwarf, I did try adding in some moons, even a planet that would be tidally heated to habitable temperatures and lit by the dwarf's own luminosity. But for some weird reason such an orbit wobbled the orbit of the brown dwarf to an extreme extent. The apoapsis would go from 1 light year to 3 light years and back. It was crazy to even look at and I have no clue why. Would someone be able to shed some light on this? To replicate this, try placing an earth sized object in a not-too-distant orbit around the brown dwarf. Mysteries? Ok, time to get that imagination flowing for the next one. That wobbling is just the exaggeration of the real effect the planet has, but Earth could orbit Jupiter no problem, so introducing an earth-sized planet around a brown dwarf should definately be no problem other than the annoyingness it might make with "orbits" turned on. I've noticed this with trinary star systems. The inner binary stars show an odd but stable figure-8 orbit while the outer circumbinary star's orbit does this weird pulsating movement. If you speed up time and watch the regular "trail" visuals, it stays on its regular orbit. Here's what I've been working on, straight out of the StarFox universe. I've added most major planets and a few minor objects of the Lylat System, many of them fan-made but still have the potential to be canon. I still have yet to add the rest of the minor objects, such as the twelfth planet of the Primary Lylat System (nothing special about the planet besides its wildly eccentric orbit), asteroid belts, moons, and "Sector Omega" with Andross's little planetoid Venom and the space graveyard. Some of the things that I can't add yet are the small nebulae sectors of the system since there's no actual "nebula" object in the game. It's possible that I could simulate the Omicron Nebula (fan-made) with a hydrogen ring around the planet Slaga (the planet Solar, just renamed; resides at the center of the nebula, heated by extreme magnetism; in the case of US2, a ridiculously thick atmosphere), but it's not exactly what I had in mind. Keep in mind that some of the things are not consistent with some other fan sources, such as "Arwingpedia." Some aspects of Arwingpedia's material are inconsistent in and of themselves. For example, Macbeth is labelled the "third planet of the Lylat System," yet the description goes on to say that it "orbits closer to Lylat than any other planet," which would make it the first. While I didn't follow the map exactly, it was a good source of inspiration. 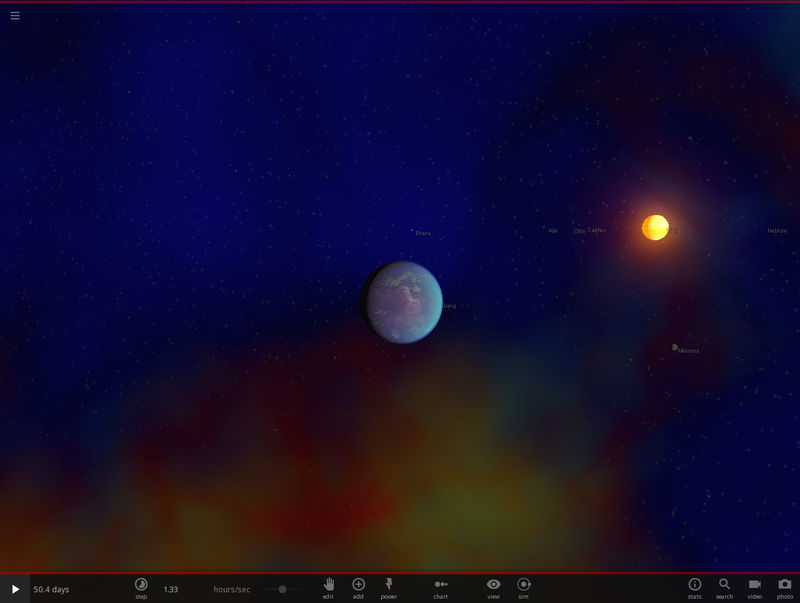 Other planets, such as Freo, Shardria, and Crimsona, are my own ideas (a red gas giant was unrealistically visible in the Sauria mission from StarFox Assault; Crimsona is that gas giant with a more realistic orbit), and some, such as Kew, Papetoon, and Animus, were vaguely referenced in past StarFox games (Animus was referenced in the unreleased N64 Dinosaur Planet before it was reimagined as StarFox Adventures). EDIT: I'm already renaming a couple of things. What was previously Kew is now "Volus" and Crimsona has inherited the name Kew. Mysteria is now "Krazonis." I have yet to update the file. Here's what I've been working on, straight out of the StarFox universe. I've added most major planets and a few minor objects of the Lylat System, many of them fan-made but still potentially canon. While I have not heard of Starfox, this is certainly a rather sophisticated and well-designed system. If you are still required to implement the rest of the minor objects to complete this, the final revision of this system must be rather extraordinary, not to mention time consuming to achieve. Had you not mentioned this was still unfinished, I would have considered it pretty much all done. Trinary systems like this one are always quite pleasing to gaze upon in terms of aesthetics. Here is a screenshot I took near planet Tian, with Solran and Lylat Prime in the background as part of a double sunrise. Hope you like it. - A small asteroid ring for Tian. - Two slightly larger asteroid rings for Titania. - A relatively small asteroid ring for Kew (which I'm renaming to Volus). - The exotic moon "Cryona" orbiting Freo and maybe some more moons. - Two moons for Corneria, one with its own two very small moons. - Various moons for many planets in the system. - The Meteo Asteroid Belt for Lylat Prime between the orbits of Corneria and Fortuna. 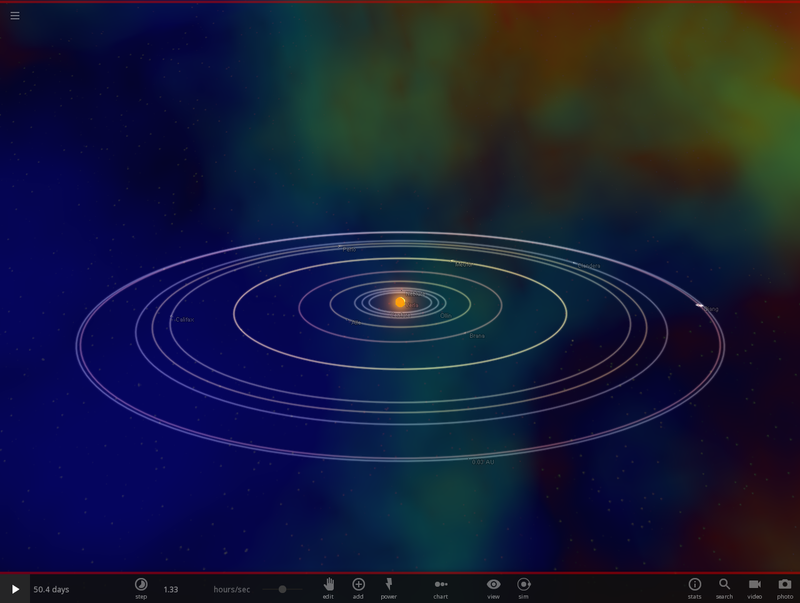 - The Sargasso Asteroid Belt for Solran between the orbits of Macbeth and Tian. - The Enigma Asteroid Belt for Mysteria beyond Sauria's orbit. - A twelfth planet in an extremely eccentric orbit around Lylat Prime (got a good name for it?). I'm also renaming Kew to Volus and giving Crimsona the name Kew to be more consistent with canon. And yes, I have also noticed that some of my planets—especially habitable planets—start off at very low temperatures upon loading a simulation, even if they were at stable temperatures the last time I played. It's probably not a bug, but rather that temperature settings haven't been made to save when exiting a system at the current point of US2's development. Not a big issue as you can manually edit it or just do something else while it returns to normal. I remember a few updates ago, the strength of magnetic fields wouldn't save and would all reset to 0 gauss upon loading a simulation. Thankfully it has been fixed. That was a real pain for me. Er... Change of plans on most of the moons and smaller asteroid rings. The wonky orbitals and lag are ridiculous. I'm going to leave those out for the final version. I might add a separate save with Corneria and its moons. I'll still add Volus and Freo's moons in the main save, though. They're big enough to handle them without wacky trajectories. I've renamed yet another feature; Mysteria is now Krazonis. Still working on what the twelfth planet will be like. I'm leaning towards the name "Alios." I'm thinking of making it a Mercury-like planet with an unusually fast rotation. Sorr is a young binary star system at 22.2 million years of age, consisting of a blue giant and a sun-like star. The two stars orbit each other at a significant distance, and thus have each developed planet systems of their own. Conditions have been favourable, and a handful of potentially habitable planets have emerged. But a dark shadow looms over the future of Sorr—the impending cataclysm following the supernova of the ageing blue giant star. The larger of the two stars, Sorr A dominates the system at 10.8 times the mass of the sun and 28,345 times its luminosity. Sorr A's formation process consumed most of the gas clouds and material in the near proximity, and later blasted more material away from the inner Sorr system with its intense stellar winds. Despite its overwhelming shine, the curtains are closing for this player on the celestial stage. Now 22.2 million years of age, Sorr A has consumed almost all of its fuel, and has ballooned to 83.6 times the solar radius. The giant star is expected to become a supernova in around 100,000 to 200,000 years, likely tearing the system apart with the explosion. Sorr B is the smaller, sun-like star of the Sorr system. It orbits Sorr A at a distance of 315 AU. Sorr B weighs in at 0.85 solar masses, and is tiny compared to its companion star. Due to its relatively far distance from the blue giant, Sorr B was able to escape the fate of the majority of its material being stolen by the larger star during its formation, and survived to grow to a fairly respectable size. When Sorr A's stellar winds threw material to the outer system, some of this material became captured in the orbit of Sorr B, while others merged with protoplanets around it, adding to their mass where otherwise, there would have been insufficient material to form many planets. Some remainder debris has coalesced into an asteroid belt in the outer Sorr B system. Compared to the ageing Sorr A, Sorr B is still at an extremely young age. If the system is able to survive the upcoming supernova of Sorr A, its habitable planets would certainly have a possibility in developing life in the long run. Uitiaponsula is a gas giant in a tight orbit around Sorr A that has influenced the evolution of the system to a rather significant extent. At 12.5 Jupiter masses, a little more massive and it would have been considered a brown dwarf. While it orbits Sorr A at 5.32 AU, this is a very close orbit for such a large and luminous blue giant. As a result, Uitiaponsula glows at a sizzling 1450°K (1177°C). It actually formed at a much farther distance from its star, but even as Sorr A expanded, nearing the end of its life, Uitiaponsula migrated inwards. Its strong gravitational pull threw the inner Sorr A system into chaos, ejecting many preexisting bodies or absorbing them. In the present, the inner system is almost completely devoid of objects or debris except for Uitiaponsula. Only two planets in the outer reaches of the Sorr A system survived this process. Being a young system, Sorr still houses an appreciable amount of debris. The majority of this material is either in orbit around Sorr B or circling Sorr A beyond the orbit of Sorr B. The chaos the system had undergone has cast a number of objects out of the system, but some have developed highly eccentric and inclined orbits. The majority of Sorr A's comets originate in the asteroid belt beyond the orbit of Sorr B, at a distance of 900 to 1500 AU. These require thousands of years to complete a full orbit. However, many of these comets' orbits are not stable. Perturbations from Sorr B and Uitiaponsula affect the bodies' tracks over time. For a star of such mass, and considering the chaos resulting from Uitiaponsula's inner migration, there should be many more rogue comets and objects than what appears in this simulation. I have excluded the majority to prevent the system from cluttering. Sorr B is essentially a miniature solar system orbiting a larger star, and thus has its own collection of comets. Most of these originate from Sorr B's own asteroid belt, located between 15 and 25 AU. As of present, the Sorr system contains five planets with liquid water. All are within the orbit of Sorr B. Due to these planets being illuminated by energy from two stars, the habitable zone display in-game around Sorr B is actually rather misleading. To be habitable, planets must be on the outside edge of the "displayed" habitable zone around Sorr B, or outside the zone altogether. A planet with a sufficiently thick atmosphere in the green area of the "displayed" habitable zone around Sorr B would actually suffer too much greenhouse effect, as it receives energy from two stars. The history of habitability in this system as been—and will be—rather volatile. Over the 22.2 million year span of the system's existence, Sorr A had ramped up its luminosity as it churned through its fuel. This pushed the habitable zone further out in a relatively short amount of time by astronomical standards. This habitable zone is set to essentially disappear when Sorr A explodes in a supernova, owing to its extreme temperature and radiation. If Sorr B is not launched away from the system due to the explosion, it is unknown what effects may result from the radiation of the neutron star that would be produced as part of the supernova. The radiation may be too deadly for organisms to survive, at least on the surface. If Sorr B is launched into deep space from the force of the explosion along with its planets intact, the habitable zone would be brought closer to Sorr B as there would be no second star present to provide further energy. Planets that have liquid water at the present may freeze, and planets too hot for the development of life may be brought down to more suitable temperatures. As of the current, all habitable planets still hold vast amounts of residual heat from their formation. While liquid water has appeared on their surface, volcanic activity is highly common, and the atmosphere is in the process of change. Unfortunately, there is no method to simulate this as of yet. So, while these planets may appear blue and cozy in the simulation, they are actually still quite hostile. Furthermore, 22.2 million years is certainly not close to being enough for complex life to have developed. These are the several paths habitability may branch in the Sorr system. But until Sorr A exhausts its fuel and explodes in a supernova, no one can know for sure what the future holds for Sorr. Figure 3: Due to illumination from two stars, for a portion of a planet's orbit, night vanishes altogether. Figure 4: Double sunrise on an alien world. I have position locked Sorr A at the centre of the coordinates because I dislike stars straying due to a gravitational pull. Therefore, this is not a "true" binary system. But Sorr A is so much more massive than Sorr B, it wouldn't make much of a difference even if it weren't position locked. Being a young system, Sorr has a vast amount of particles and debris. Some devices may not be able to handle this, and therefore I have attached two ubox files: one with particles to simulate a realistic young star system, and one without particles to aid players with slower devices. Aye, that's noice. I imagine that, once Sorr A explodes, Nus Tutor would be the most habitable planet around Sorr B. The planet gets a very nice double sunrise, triple if you count the red-hot Uitiaponsula that shows up surprisingly well from that distance. Being the sci-fi nut that I am, I came up with a theory for Lylat's stars where, since the system is so close to the galactic center, they cycle through matter from the vast nebulae in that region of space, possibly spurred on by some form of dark energy. It makes them anomalously long-lasting, with Lylat Prime predicted to easily survive for trillions of years. Perhaps Sorr A could be a star like this. I notice that you like to use that red nebula as a background. Sorr A could draw fuel from surrounding nebulae, blasting out the dense waste elements to remain the dominant star of the Sorr System for longer than expected. Perhaps Sorr A could be a star like this. I notice that you like to use that red nebula is a background. Sorr A could draw fuel from surrounding nebulae, blasting out the dense waste elements to remain the dominant star of the Sorr System for longer than expected. For those magnetic fields, it was I who overlooked them. Thinking about it again, 22.2 million years isn't long enough for many objects to cool. Combined with generally fast rotation speeds across the board, most objects should have a magnetic field. Smaller objects wouldn't have very strong magnetic fields, but it should be a magnetic field nonetheless. Eventually, smaller bodies such as moons would cool to the point where their core becomes solid and cease to produce a magnetic field. I have attached a new revision of the system with a fix on the magnetic field issue. Hello. At the moment I am working on a star system called the Parathesia Star System. So far, I have finished the inner section, the asteroid belt, an outer planet, and a few comets. [IP] A bunch of other stuff I forgot to list. A strange system that has a pulsar as the planet's star. That's unique right there. The purple high-temperature plant life is an interesting concept. It's always fun to theorize about life like this. I'm picturing a hybrid between a fungus and a plant that thrives on the radiation blasted out from the pulsar, an atmosphere that would be toxic to us, highly acidic oceans, and intense volcanic activity spurred on by the tidal forces from the planet's orbit around the dense stellar remnant. Is it bad that I like ammonia planets better? This is the most packed solar system I've ever made! Here a Binary Star System which i still have some work to do. How i made it? with my Accretion disk technique...and i will create the few moons on the same way. a planetary disk of more than 150k bodies making up 3 Jupiters in different materials each with their own range from the star. this is about 2 weeks worth of work mostly because of a few setbacks and remakes. the sim is also very slow. i'll post the actual sim when it gets more developed because it's currently too large. The Luka System is a unique system that is regarded as one of the most beautiful in the whole universe. It has around thirteen planets and one comets. It has been nicknamed "The Unlucky Universe" after closer examination by probes and telescopes. 1. Askan - It is said to be as old as the sun itself. It's around 1.39 earth sized with a degree of 3836c. The surface is completely molten lava. Thus, making it an horrendous lava waterworld with no chance for life. The planet is approximately the closest to the sun. 2. Hotanomai - Initially, it is believed that the planet was much further from the sun was relatively in the habitable zone same as Green. However. Due to it's 1.00 Jupiter size. It was attracted closer to Luka's orbit by a 14th planet in the system that was supposedly a rocky planet that served as a buffer zone between the inhabitable and habitable zone. Shortly after. The planet neared the smaller rocky planet and through unknown means. The rocky planet was somehow crushed by Hotanomai's gravitational force. The remainder of the planet quickly formed a ring around the planet as Hotanomai became a molten lava waterworld just like Askan. It attracted an earth-sized Gas Giant with an habitable zone moon that yielded great scientific facts. The Gas Giant became a moon towards Hotanomai and later was reduced to a small fragment barely noticeable. It retains it's former name "Hotanomai-1". It was ruled completely uninhabitable. It currently is 1700c. 3. Smallameltinc - A lava waterworld with absolutely no chance of survival for anyone. It has a size of 23.9 moon, making it relatively one of the smallest planets in the Luka System. It is uninhabitable. It currently is 1635c. 4. Trustaby - a Rocky planet the size of 1.30 earth. It is much more cooler with a degree of 511c. The surface is able to be seen unlike the first three planets in the Luka System. It has a mars-like landscape and blue streaks around it. The blue streaks appear to be a natural resource that is very much in abundance. It has been called "Blue Oil" not because of it being similar to gasoline but because the Luka system is the only system with "Blue Oil" in it. The planet is not habitable. 5. Cricket - A rocky planet. 1.01 earth sized with 625c as the temp on the planet. It is uninhabitable and possesses no "Blue Oil" but has streaks of an unknown dark red material. Oddly enough. 6. Tarson - A rocky planet. 2.79 earth sized with 401c as temp. It possesses no major resources or significance. It is uninhabitable like the first planets in the system. 7. Greyworld - A rocky planet. 55.8 moon sized with 85c on surface. It's surface is completely covered in "Blue Oil" thus making it a mineral-rich planet that could one day be mined if the miners can get past the hot temp on the planet. It was misnamed because the telescope picked up the blue as Grey instead. 8. Green - A beautiful planet located far enough from Luka to make it habitable. According to early astronomy reports. The planet was supposedly a water world before the water declined somewhat, revealing a brownish-ground. Later, it grew to be green which hints at an thriving ecosystem. It was named Green for it's very beautiful green landscape. Luka appeared to have an influence on the atmosphere by making blue clouds rather than white. It has a good chance of being habitable and is probably already inhabited by some sort of creature (land or underwater.). It is 3.00 Jupiter sized and has a temp of 37.7c. 9. Dashard - A grey rocky world. 20.0 earth sized with -103 being the temp. It has one moon named Dashard-1, which resembles it greatly but is a lighter color. 10. Bluestorm - It was named Bluestorm for it's originally blue appearance which was marked as beautiful. The planet later had a moon which caused an upsurge in temp to 2195c. It is 20.0 Jupiter. It is a gas giant. 11. Homa - A gas giant that is 3.51 earth sized. It has no notable features. 12. Eye - A large rocky planet that is 1.00 jupiter sized with no major exploitable minerals ad of course, any life due to i being a very cold planet. It was called "Eye" due to it being able to watch the system from afar and not be harmed by any heat or such. Luka's Comet - A comet that is in orbit between Bluestorm and Homa. Heat - The system has a problem with heat. Being very hot at times in certain places of the system. Radiation - On unprotected planets. Luka generates a lot of radiation which is so much, it could instantly kill a human. Green and Dashard (Dashard for some reason) are well protected, along with Eye and Homa. Aye, that's quite nice, Luke. I had a look. It might not be 100% realistic in terms of how solar systems can appear, but what's important is that you used your imagination to build your own vision of a star system. I do have a few tips to give you. That star is Rigel, isn't it? I could tell immediately. It's nicer to modify some parameters of the star so it's unique. Maybe keep that in mind for next time. For a comet to be a comet, it should hold an elliptical orbit that brings it close enough to the star that the water in it begins to melt and turn into gas. Otherwise, it is an asteroid. Therefore, adjusting Luka's Comet's eccentricity so that its closest approach to the star heats it to about -20°C to 20°C should be ok.
Bluestorm is very hot because it is Brown Dwarf. Objects above 13 masses of Jupiter are classified as "Brown Dwarfs"—failed stars that do not shine like the stars we know but still emit a lot of heat. On the planet "Green," you set the atmospheric pressure to be very low. The lower the atmospheric pressure, the lower the temperature water boils. The game doesn't simulate this yet, but if the pressure on Green was so low, water would boil at room temperature, so you wouldn't see the oceans on it. And yes, radiation is a big problem on these systems. One way you can protect a planet from the star's radiation is if you go to Materials > Magnetic Fields and add a magnetic field. There are quite a number of little things regarding realism that doesn't quite work in this system, but I didn't dive too deeply into realism aspects because worldbuilding is about constructing your own representation of a system. I have to admit, I am hugely obsessed with the realism of a system, and maybe that's a bad thing because I constrain myself to model off other solar systems we have already discovered, limiting my creativity to a certain extent. Ensuring a system is realistic means I have to invest a tremendous amount of time testing it, especially orbital stability. 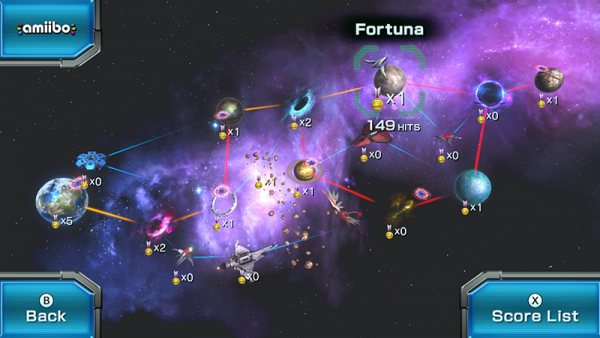 The star systems I make take about a month to finalise, with a day or two of total playing time. Nevertheless, if you are interested in knowing more of how a solar system evolves in the real world and try to model that in the game, I'm open for discussion, but maybe not on this thread. I'll PM you on how to contact me privately to discuss Luka. The Medina system was named by Saudi Arabian scientists who discovered it in 2032 after the launch of NASA's DeepSpace Telescope which allowed never before seen star systems to be seen. The Saudi Team quickly discovered a system not too far away from Sol which was pretty basic and almost resembled earths in a way. It was named Medina after the Saudi city of Medina. 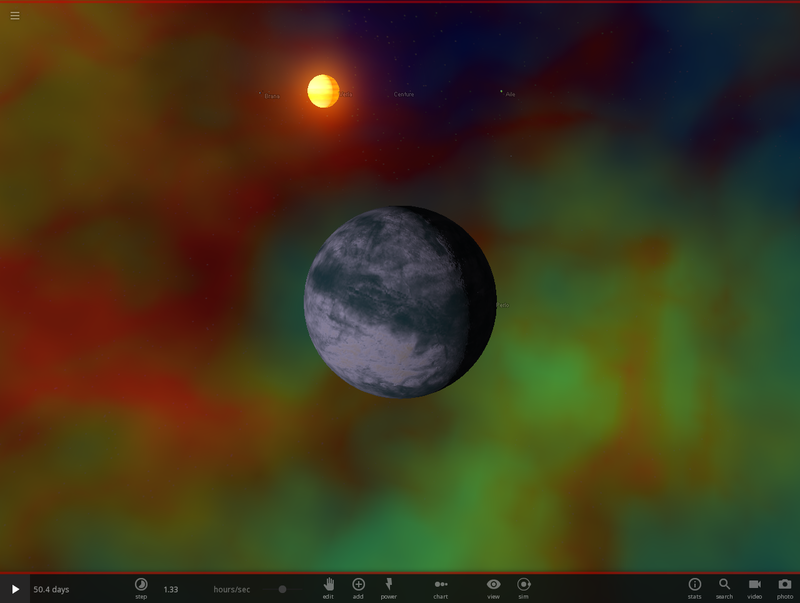 Narkin - The first planet to be discovered and admittedly, the hottest and ugliest. It comprises of a scratched vomit-yellow surface with what appears to be an unknown blue element scattered around the planet. So far, Narkin is the only planet that has this unknown blue element in this system. It reaches well above 1000c. Not a whole lot is known about it besides it was not that close to Medina until the original planets nearby crashed in to eachother which dragged Narkin closer from the habitable zone. It lost it's atmosphere and magnetic field quickly and became a hot-zone. Mecca - Second planet to be discovered. Named after Saudi Arabia's holiest city. Admittedly, also the most beautiful. It has flowing oceans of H20 and what appears to be grass, some flat-lands and snow-capped mountains hinting that there's seasons and of course a diverse weather system on Mecca which by far makes it the most unique planet in the whole system. It is around 19c. The planet has always been in the habitable zone and is rumored to be as old as the sun itself. Despite changes around it, it has always remained in a consistent orbit. Whether it's by pure luck or alien technology. Who knows? Alas - Third planet to be discovered, named Alas after.. you know, alas. Well. Basically, it's an desert planet that is around -150c and has an atmosphere. Technically, it used to be habitable until it was pulled from it's habitable zone orbit by a far larger gas-giant in Medina's system which vanished sometime later through luck for Mecca and Alas or by some sort of Alien technology?